Miracles Do Happen… Even when you’re driving in an Uber! About a week or so back, I was getting ready to go to Bandra, to catch up with some of my close friends. And as I usually always do, I called for an Uber to pick me up. Being the extrovert that I am, I carry forward a simple “Hi” or a “Good morning or good evening”, into a longer and personalized conversation with the Uber driver, depending on his willingness and desire to chat. Some are friendly, and some choose to avoid indulging into a conversation. But for this particular instance on that day, I don’t know what or who the driver was, but the second I stepped into his car, we began talking casually about the day and the daily pressures of a common man. Not only was he incredibly knowledgeable with tremendous insight about various skills and qualities that one needs to survive in a city like Mumbai, but what stunned me was how intently he was listening to some of my experiences abroad and in India. But what made the conversation truly special, was when I started talking to him about Ratan Tata and Narayan Murthy. He had heard about them vaguely, but nothing about their spectacular achievements and accolades. He most certainly was unaware about the kind of respect they and their organizations held in society. Story after story that I narrated to him, his response was nearing speechlessness. He was pleasantly shocked and so in awe of the fact that there are still some people in this world who give their moral, values and ethics more priority than anything else. He told me about the upbringing that he’s given his three kids and the value of education in today’s day and age. He went on to say – “Sir, for me whether you’re an Uber driver or the Prime Minister of the country, you must be educated and well rounded in your sphere of thinking. I am a progressive thinker and I believe in positive change for the betterment.” I was just as taken aback by his thought process and functioning, because neither did he know me or anything about my life, but just that basic fundamental ability to connect two similar mindsets, was what empowered me. As the drive from Parel got nearer to Bandra, on a day with surprisingly no traffic post 7pm, I recollect telling him that this was the first time that I wish there was traffic at every inch, so we could have more time to talk and interact. He had goosebumps at the fact that there had supposedly been no other passenger that found him this interesting and excited to know more about him and his life, than I did. For me, it was a source of learning and in many ways an eye opener. It reminded me of the fact that you don’t need materialistic gains nor do you require physical assets, if you’re desire is all about teaching someone (be it anybody), something truly extraordinary about everyday life. As we reached Bandra, I requested for a picture which he happily agreed to. He was so inspired by the humility and the colossal image of Ratan Tata & Narayan Murthy, that he told me he would go back home, watch their speeches on YouTube, and personally write both of them a letter on how high in regard he holds them from this day onwards. 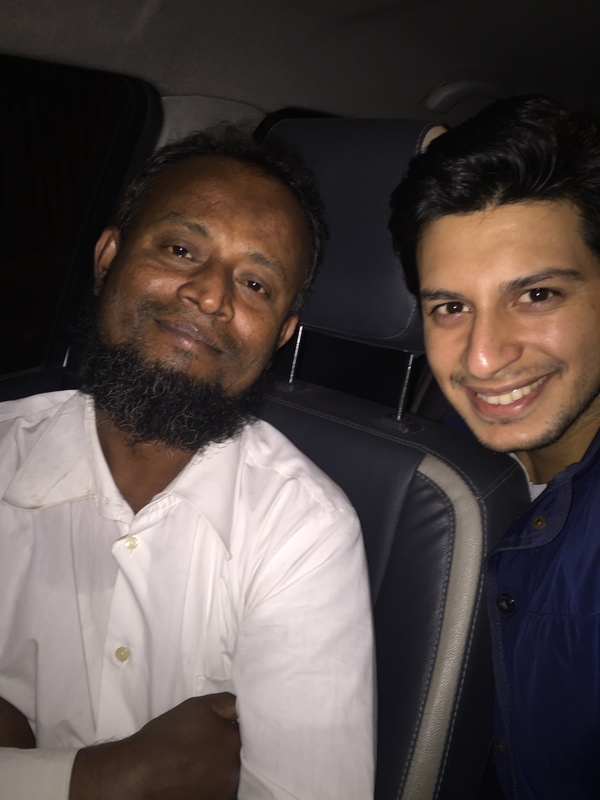 This charismatic and incredible Uber driver leaned forward to shake my hand and thank me for teaching him something which he labelled as “life changing” for him. I don’t know if he’s written those letters to Ratan Tata and Narayan Murthy, but he left me with tears of happiness in my eyes as I left the cab after blessing him countless times. He taught me much more about life than perhaps any textbook or instance could have. There was something immensely large hearted about this man that shined throughout the course of our conversation. And because of his genuine humility and appealing nature, I’m so indebted that I was privileged to spend an hour and a half of my life with this special human being.